Sometimes at the end of a meal you just need something sweet. This recipe comes in time for Valentine’s Day, combining two top 10 aphrodisiac foods bananas and chocolate, making for a perfect ending for a romantic dinner. Plus it comes without the guilt, as this a dairy-free, gluten-free chocolate banana mousse. You can make this mousse for four servings or two large ones, I found myself eating 2 of the four servings as I just wanted a bit more. To make this mousse, slice two bananas length-wise and place on a cookie sheet sliced side up and broil for six-seven minutes. The bananas will be a bit browned. Turn them over and broil for three minutes on the other side. Set aside. In a mixer on high speed, whip egg whites with teaspoon of salt until stiff peaks form. Set aside and then add the egg yolks to the mixing bowl with sugar and beat until the color is a light pale yellow. Add the bananas and cocoa powder to the egg yolks and mix through. Add the chocolate chips and mix through. Then, fold in the egg whites and pour mixture into ramekins. Bake in a water bath for 30 minutes to prevent the mousse from burning and help it cook evenly. 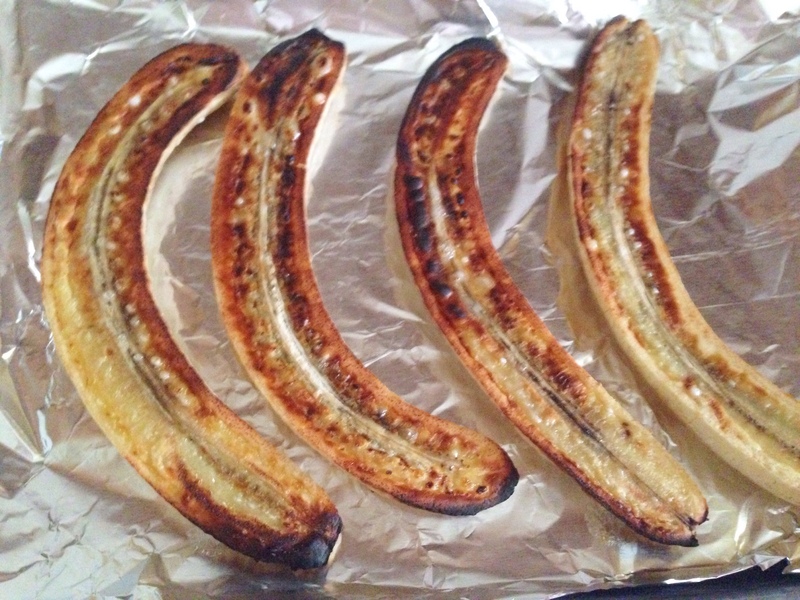 Slice bananas lengthwise and broil sliced side up for 6-7 minutes on one side until they are a bit browned. Turn over and broil for 3 minutes on the other side. Set aside. Preheat oven to 360°. In a mixer, whip egg whites with teaspoon of salt on high speed until stiff peaks form, about 3 minutes, and set aside. Add the egg yolks to the emptied mixing bowl along with the sugar and beat until light pale yellow, about 3 minutes. Add bananas and cocoa powder and mix through. Add chocolate chips and mix through. Then fold in the egg whites and pour mixture into 4, 6 oz ramekins or 2, 10 oz ramekins. 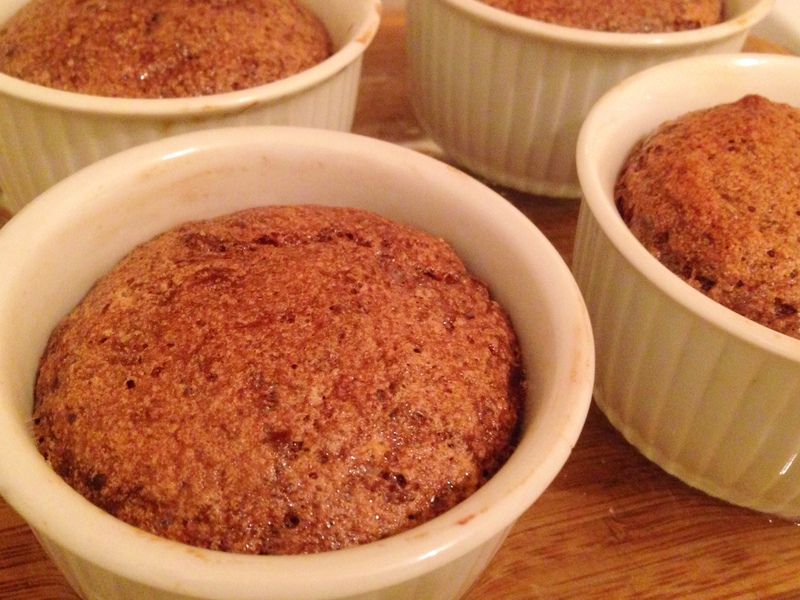 Place ramekins in roasting pan or Pyrex pan and add water halfway up the ramekins. Bake for 30 minutes. Garnish with powdered sugar, optional. 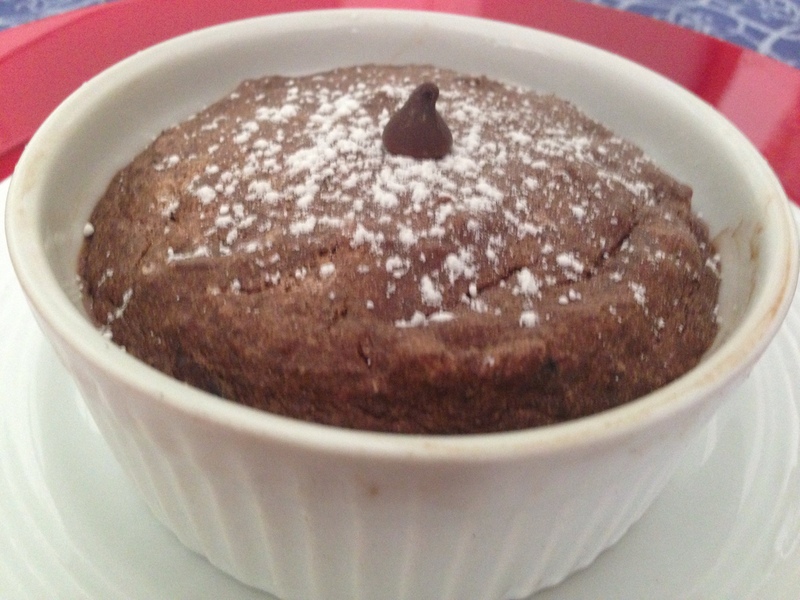 This entry was posted in Blog, Recipes and tagged banana, chocolate, dairiy free, gluten free, mousse on February 8, 2015 by Leslie.